Sanathana dharma i.e. Hinduism has six systems of philosophy based on Vedas, which are known as Shad-darsanas. Each is a way of looking into the Truth. One of them is Uttara mimamsa, also known as Vedanta, as the philosophy is based on Upanishads, which constitute the latter part of Vedas, i.e. Veda anta bhaga. Vedanta has three main subsects Advaita, Visishatadvaita and Dvaita. They all base their philosophy not only on Upanishads, but on Brahma Sutras and Bhagavad Gita as well and all these three together are called “Prasthana Thriam”, three authoritative texts. The difference between the systems arises due to the difference in their interpretation of the texts. Before going into a brief discussion of the three Vedanta schools of philosophy and their treatment of Athma, let me at the outset explain that I will be referring in this blog, Athma, the sentient force behind the body-mind complex, as Jeevathma and Brahman, the Cosmic equivalent of Athma, as Paramatma. Jeevathma is what is commonly referred to as soul in all religious literatures. Dvaita is a Sanskrit word that means "duality, dualism”. The Dvaita or "dualist" school of philosophy originated with Sri Madhvacharya who was born in Karnataka state in 13th century. 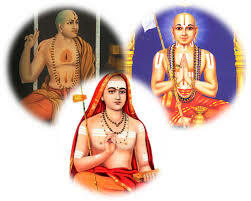 Madhvacharya called it Tattvavada and based his philosophy on Bhagavatha puranam as well along with Prasthana Thriam. To Madhvacharya Lord Vishnu is the Paramathma and Paramathma is saguna and is different from Jeevathmas, which are many, and from the insentient objects, Jada. Paramatma is a real eternal entity that governs and controls the universe. According to Madhvacharya there are two orders of reality: 1. svatantra, independent reality, which consists of Paramatma alone and 2. paratantra, dependent reality, which consists of jeevathmas and jada. So as per Dvaita philosophy, there are three realities Paramathma, Jeevathma and jada, one independent and two dependant on the one independent. Jeevathma can never be one with Paramathma and Moksha, Liberation, is described as the realization that all finite reality is essentially dependent on the Supreme Paramathma. Bhakthi yoga is the means for Liberation. Further Jeevathmas are divided into three grades. One grade of Jeevathmas, mukthi-yogyas, only qualify for liberation, another, nithya-samsarins, are subject to the eternal transmigration cycle of entry and exit in bodies while a third grade, tamo-yogyas, are condemned to eternal hell. So in a nutshell as per Dvaita philosophy, Jeevathmas are many and Jeevathma is the servant of Paramatma and Jeevathma can never claim unity with Paramatma. The Vishishtadvaitic thought is considered to have existed for a long time and Ramanujacharya who accepts the Prasthana Thriam as well as the works of Alwars as the source of authority for his philosophy is now revered as the main proponent of Visishtadvaita philosophy. Visishtadvaita is so called because it inculcates Advaita, oneness with Visesha, attributes. Like Dvaita, it holds Lord Vishnu as Paramathma and He is supreme as creator and redeemer. He is saguna, with qualities of omnipotence, omniscience and infinite love. He has no base attributes like sorrow, mortality, and change in Him. Ramanujacharya introduces a new concept “aprathak-siddhi” meaning “inseparability” to define the relation between Paramathma, Jeevathmas and Jagat. All the three are Real but they are not separate Realities, as Jagat and Jeevathmas form part of Paramathma as His body. Paramathma is Angi and Jeevathmas and Jagat are His Angas. So all the three are eternal and inseparable but not the same. The three forming one is the non-duality part and Jagat and Jeevathmas inhering in Paramathma as attributes to a substance is the qualification part of non-duality. So in a nutshell Jeevathmas are many and part of Paramathma but not Paramathma itself like a seed in the jackfruit which is not jackfruit itself. Though there had been earlier exponents of Advaita philosophy it is Sri Adi Sankara who perfected it and gave a finishing touch to it. The Advaita philosophy enunciated by him is beautifully summed up in one line “Brahma Satyam Jagan Mithya Jivo Brahmaiva Na Aparah – Parmathma (Brahman) alone is Real; this world is apparently Real and the Jeevatma is not different from Paramatma” Here Mithya is the word used to describe the world. Mithya is not false but something which appears true but on investigation revealed as not true. For instance the blueness of sky that you can perceive ordinarily but on investigation is revealed as not true. Same way with sunrise and sunset for sun does not really rise or set. As Swami Paramathmananda states "Mithya object can have experienceability, transactability and utility but has no Reality"
In my blogs on Athma and Jeeva-Iswara Ikyam, advaitic view of Athma and its identity with Brahman have been discussed. To sum them up, Reality is Paramathma only and everything else is manifestation of Paramathma with form and name and that Paramathma is same as Jeevathma, in terms of the idiom used in this blog. To revert back to the terms used in the earlier blogs; as per Dvaita, Athmas are many and Athma is different from Brahman that is Saguna; as per Visishtadvaita, Athmas are many and different from Brahman that is Saguna, but they have a special relationship of Angi and Anga with the Saguna Brahman; and as per Advaita, Athma is one and identical with Brahman that is Nirguna, and is defined as “Existence, Consciousness, Bliss” which is its intrinsic nature. Swami Jitadmananda while describing Swami Vivekanananda’s practical Vedanta says “By Vedanta Vivekananda always meant all the three schools of Vedanta; dualism ( Dvaita) leads by the process of reason to qualified monism (Visishtadvaita) and qualified monism culminating in the same way in Advaita. Dualism, qualified monism and non-dualism (Advaita) are only three gradually ascending stages of vision which unfolds themselves as one develops finer and finer intelligence”. A jnani with advaitic vision experiences Brahman as “isness” of his thoughts in the inner mind in meditation and as “isness” behind the many in the outer world when interacting with the outer world involving duality. Fine write. Thanks and congrats. May GOD bless you to continue your noble spiritual service for many years to come.